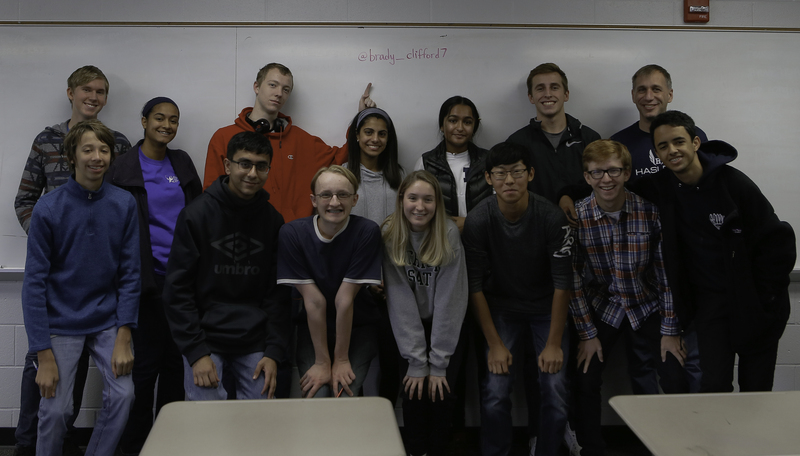 For Our 100th Riddler, Can You Outthink The Students Of Riddler Nation? Welcome to The Riddler. Every week, I offer up problems related to the things we hold dear around here: math, logic and probability. And we’ve been doing this for a lot of weeks. This is the 100th Riddler column! We published the first Riddler in December 2015. Since then, the column has taken us to futuristic pizza shops, faraway kingdoms, dystopian cities and game show stages. Most of these puzzles have started in the minds of you, the readers. You power this column, and I thank you for that. My biggest thrill as puzzle editor has been hearing stories and seeing pictures of your solving in action — with friends, during office meetings, at family dinners. It’s all the more thrilling when the solvers are students. So today I’m turning this column over to them, with twice as many puzzles as usual! Submit a correct answer for any of the problems below,1 and you may get a shoutout in the next column. (We’re taking next week off for Thanksgiving.) If you need a hint or have a favorite puzzle collecting dust in your attic, find me on Twitter. After years of hard work as a devoted tower guard, you have been knighted and are set to become a member of a brand-new group dubbed the League of Interesting and Noble Knights, or LINK. Upon coming to the first meeting, you and the other five members are seated at a round table. There, your boss, King Scott, gives a grand introduction in which he welcomes you all to LINK. The king also outlines a greeting ceremony that must take place at the beginning of every LINK meeting. The ceremony concludes when every member of LINK has met every other member with a handshake. During each round of handshakes, every member of LINK must be shaking one and only one hand. Arms cannot cross during the handshake ceremony as it is in violation of the Universal Law of Respect. Between rounds of shaking, the seats can be rearranged. After this first meeting, King Scott approaches you and asks you to answer the following questions: What is the minimum number of seating arrangements necessary to complete the ceremony for six knights? Eight knights? N knights? In the series finale of “The Office,” Kevin’s replacement, Dakota, discovers a mysterious symbol scribbled throughout Kevin’s accounting work. Confused, Dakota confronts her boss, Oscar, who explains that the symbol is a “keleven,” a number Kevin created to help him balance his accounts. In Kevin’s number system, the digit “keleven,” which is an integer that lies between two other single-digit integers, is inserted somewhere along the number line. Other than this insertion, all other digits remain in the usual order. Busy with other clerical work, Dakota hires you to figure out where keleven lies in Kevin’s number system. Where does it belong? Life as an honors math student at Haslett High School can be quite challenging. For one, all aspiring mathematicians in the Lansing area walk in the shadow of local legend Nate Silver. There are also numerous standardized tests to navigate. Take, for example, the Statistics Acumen Aptitude Diagnostic (SAAD) they will be taking next week. The test has 100 questions. The questions have no words, but each has two bubbles, and students are asked to fill in one of them. A student choosing the correct answer to the first question will be rewarded with one point; an incorrect answer causes the student to lose one point. 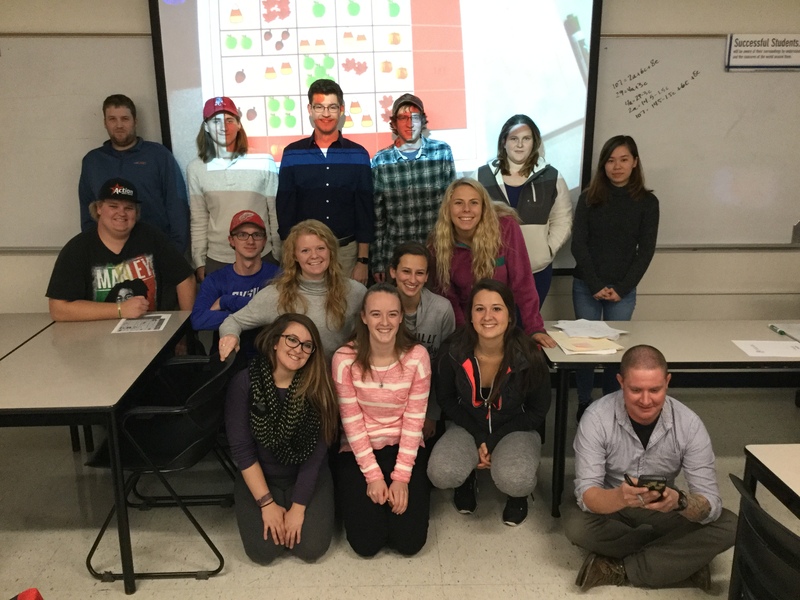 The test is taken on a computer, so the students know whether or not their answers are correct as they go. The second question is worth two points, the third is worth three points, and so on. A student also has the option to skip a question. A skipped question counts as zero points and also resets the progressively increasing point value back to one for the next question. 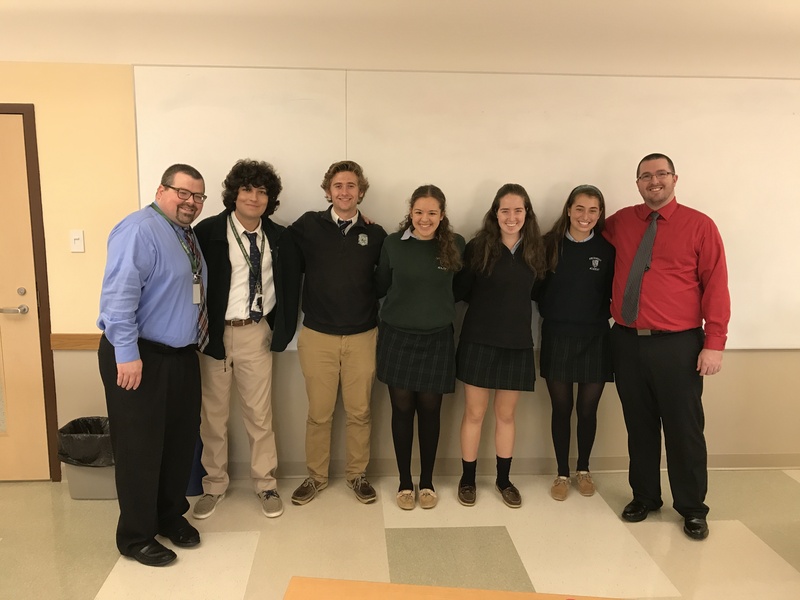 Our students desperately need the approval that only a standardized test can provide, so they are asking the good citizens of Riddler Nation to help formulate a strategy that will maximize their scores on this exam. Congratulations to 👏 Aaron Slepkov 👏 of Peterborough, Ontario, winner of last week’s Express puzzle! You were given the image below — a regular hexagon with an area of 1 — and asked to find the area of its shaded portion. It’s helpful to slice up the hexagon a bit further by drawing two more lines. Note that the shaded region is part of an equilateral triangle in the upper-left of the hexagon. 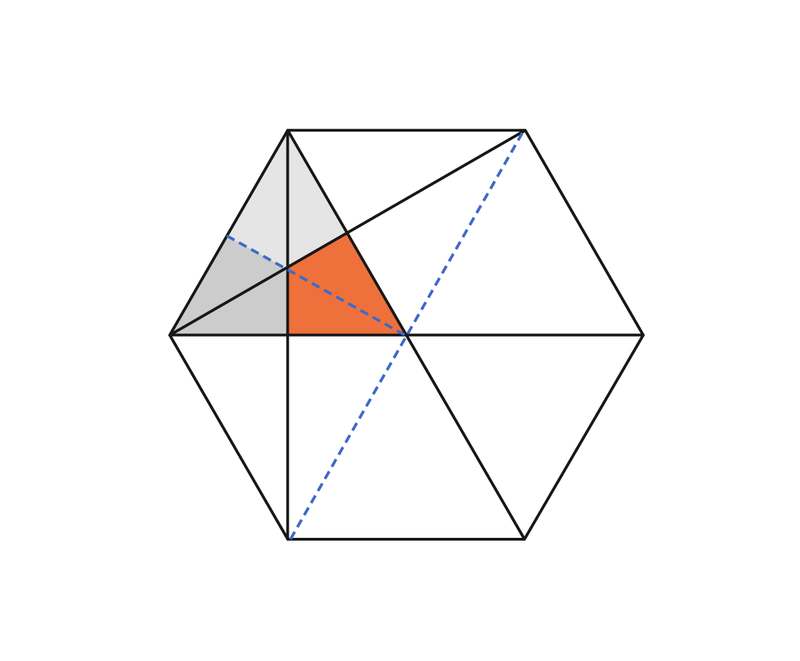 Imagine adding another line, one that slices diagonally through the shaded region, from its upper left to its lower right (dividing its kite shape down its middle longwise). 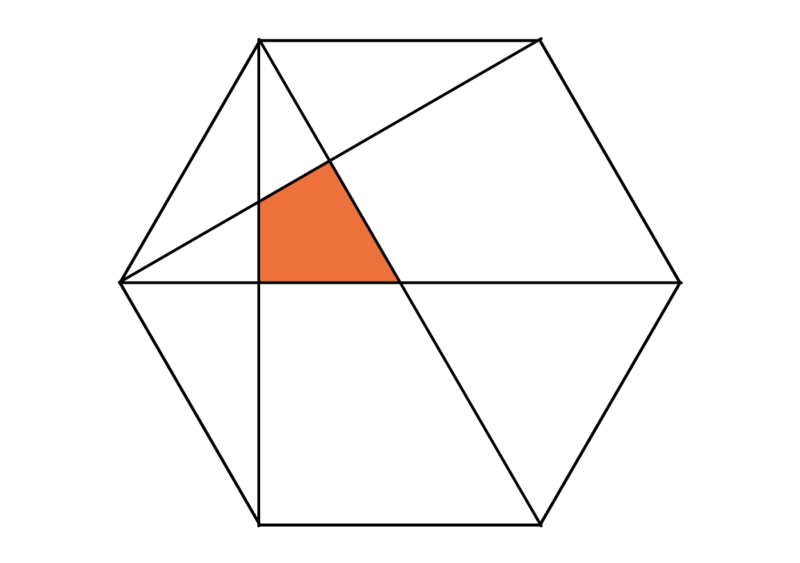 It then becomes clear that the shaded region takes up one third of that triangle. Next, slice the hexagon in half by drawing a line from the upper-right corner to the lower-left one. Now you can see that there are six such triangles in the hexagon, so the shaded region takes up a third of a sixth of the hexagon, or 1/18. Congratulations to 👏 Fletcher Christensen 👏 of Albuquerque, New Mexico, winner of last week’s Classic puzzle! You were given the image below, in which a small, orange circle with radius 2 travels down a large circle with radius 10 and then up a medium circle with radius 5. Your task was to calculate the area the small circle traveled across, which was shaded orange. Again, in helps to add some elements that weren’t shown in the original picture. In this case, we want to think about other circles. First things first: The area of any given circle is its radius squared times π.
Let’s consider the area on the left half of the image, where the orange circle is only on a downward arc. 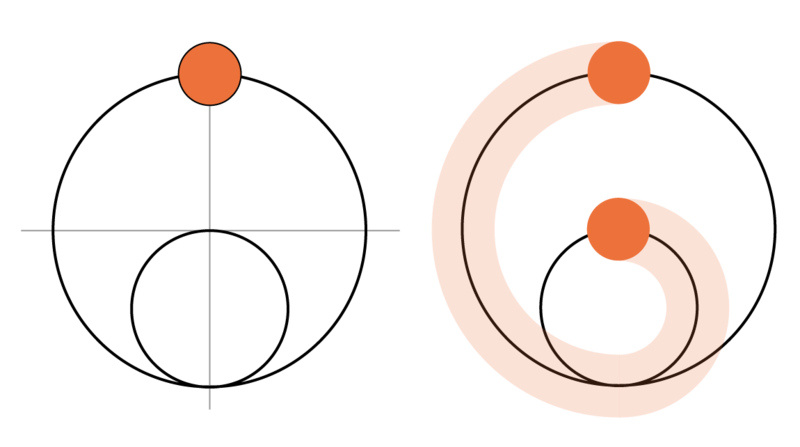 In that left half, the orange circle is essentially tracing two invisible circles as it makes its way down — the outer edge of the orange path traces a circle that surrounds the others, while the inner edge traces a smaller circle within the largest circle shown in the diagram. The outermost circle has a radius of 12 and an area of 144π. The invisible inner circle has a radius of 8 and an area of 64π. If we take just the left halves of those circles, which have areas of 72π and 32π, and subtract the latter from the former, we’re left with the orange shaded area along the outer circle: 40π. We can do that same exercise for the shaded area on the right side. Consider an invisible outer circle with radius 7 and an inner one with radius 3, calculate the areas of their right halves and subtract. We’re left in that case with 20π. All that remains is to add back the orange ball itself, which has area of 4π. So that’s 40π+20π+4π = 64π, our answer. Here’s to 100 more Riddlers! Important small print: For you to be eligible, I need to receive your correct answer before 11:59 p.m. EST on Sunday, Nov. 26. Have a great week! 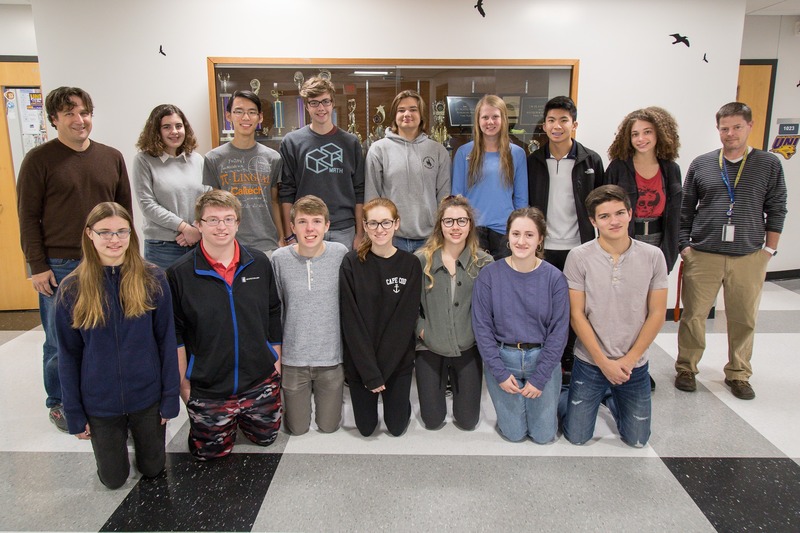 Tanner Drabek was the lead author of this problem. Also, happy disclosure: Central Academy is my alma mater. This puzzle is by Lauren Grimes, Brian Jansen, Kalyn Overweg and Jeremi Merrill. The diagram is five rows by five columns. The five boxes in the first row contain, from left to right, two leaves, five acorns, three candy corns, two pumpkins, and one apple, which sum to 31. In the second row: one candy corn, three leaves, three apples, two apples, and two acorns, which sum to an unknown “?”. 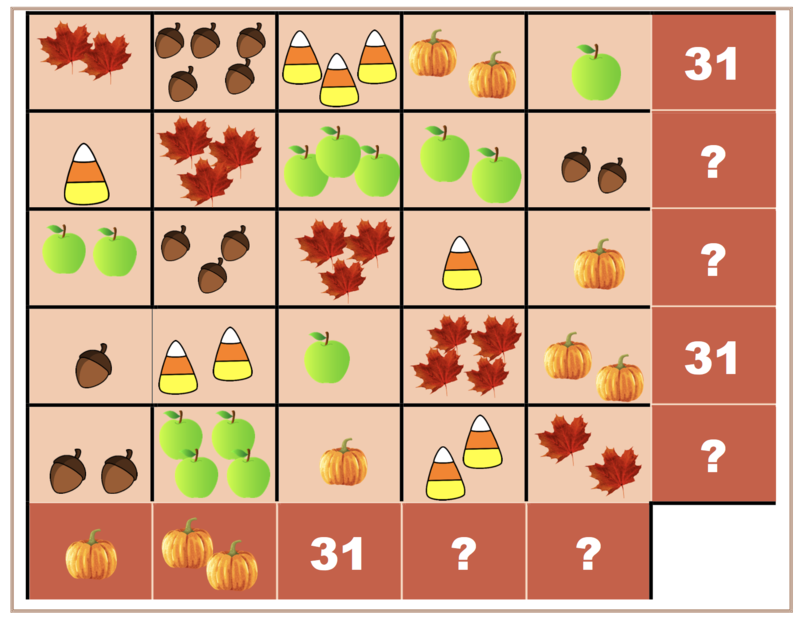 In the third row: two apples, three acorns, three leaves, one candy corn, and one pumpkin, which sum to an unknown “?”. In the fourth row: one acorn, two candy corns, one apple, four leaves, and two pumpkins, which sum to 31. And in the fifth row: two acorns, four apples, one pumpkin, two candy corns, and two leaves, which sum to an unknown “?”. The columns sum, from left to right, to one pumpkin, two pumpkins, 31, and two unknowns. If you excluded the darker orange sections of the shaded region (where the dot starts and stops), it’s 56π.